Traditional Victorian design with rounded D end shape. 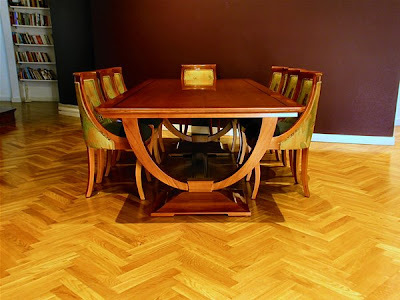 Decorative reeded and fluted legs are a feature. Traditional Mahogany balloon back chairs compliment this elegant setting. Traditional Victorian design with rounded D ends. Timber runs full length of table top to allow the flame of the grain to develop and feature. 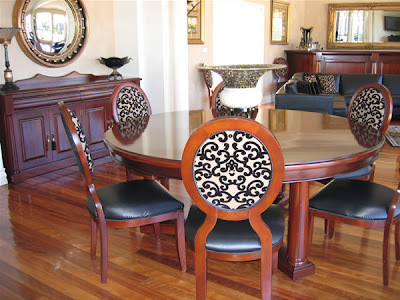 Decorative reeded and fluted legs are a feature. 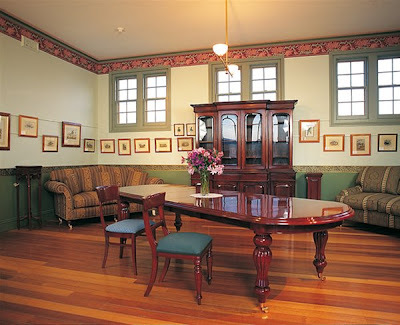 Classical Mahogany Fiddle back chairs with matching leg detail compliment this elegant setting. 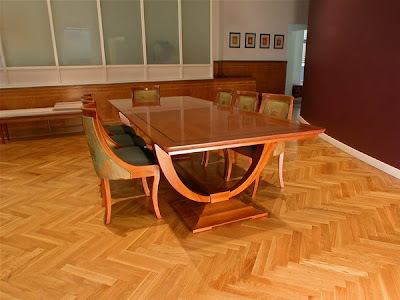 Decorative reeded and fluted legs are a feature. 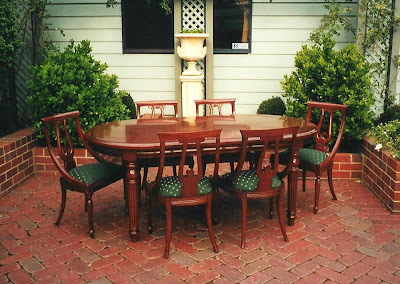 Classical Mahogany Fiddle back chairs with matching leg detail compliment this elegant setting. 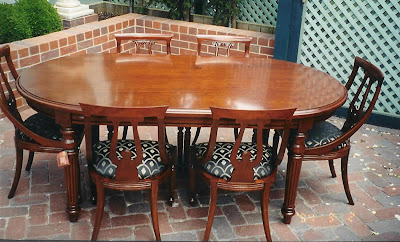 Gorgeous Solid Mahogany Dining Table with Four Beautiful heavy Mahogany Chairs upholstered in a lovely silky material. 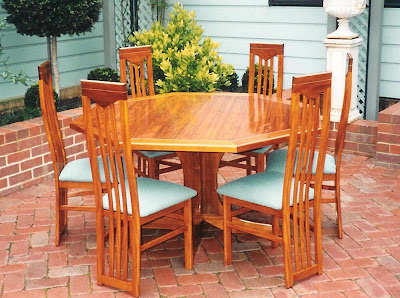 There are no extension leaves with this Table but extension leaves can be added , as this table is designed to accommodate them. Georgian furniture is larger in size with flat, plain areas. It holds a feeling of strong, heavy, clean mass of space but then highlighted with vertical reeds and flutes to soften and enhance the look. Custom built for Georgian home in Brighton. Traditional design with rounded D ends. 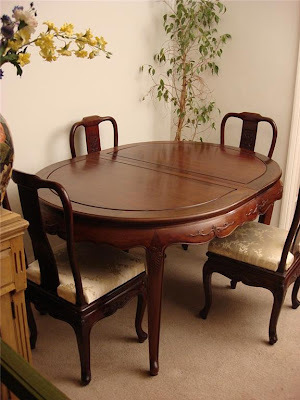 Decorative turned and fluted legs are a feature. Specially shaped Georgian side rails. 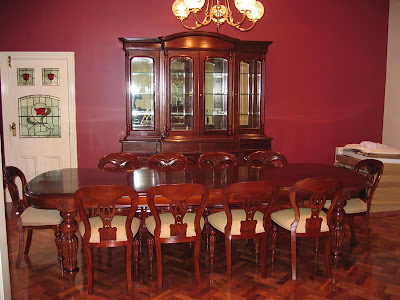 Classical Mahogany Lyre back chairs with matching leg detail compliment this elegant setting. Legs are set on a 45 degree angle to give a sleek modern look. V groove in table top adds interest. Sleek extended slats on chair backs compliment table style. 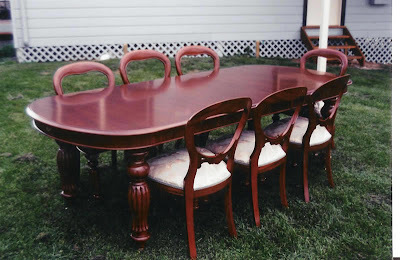 Custom designed table has a Neo Classical look with a French influence. V groove in table top adds interest. Table legs support has curved features and small cabriole legs. 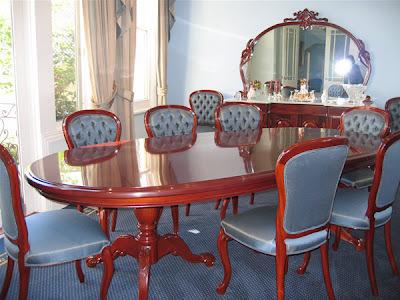 Simple Neo Classical influenced French styled chairs compliment setting. Hexagonal design and pedestal styled base gives a modern look. 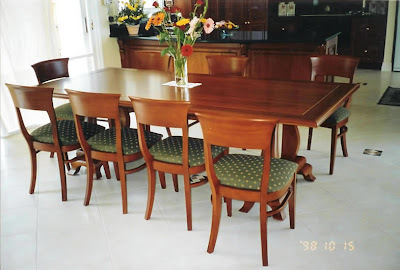 Great design for smaller area as gives maximum table size for minimal use of available space. 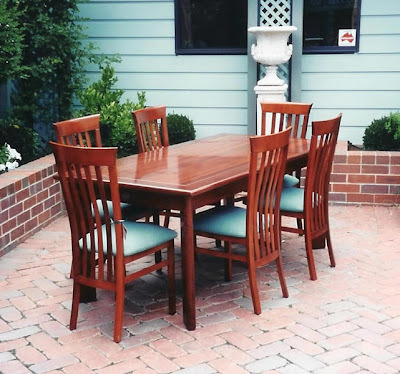 Stylish modern chairs with narrow extended slat back complete this setting. • Co-ordinate perfectly with table style • Timber frame is perfectly colour matched to table • Elegantly curved backs feature animal print upholstery • A classical Art Deco Look!